Calm K9 Training – Can using a crate help calm my dog? Imagine this: You just left your previous job and you were immediately hired by another company that your friend told you about; it is your first day. You walk in pretty confident in your abilities but you are not really sure exactly what you will be doing at this new job of yours. The first thing you do is you meet with your manager to find out what your responsibilities will be within this new company. He tells that your job will be to sit and meditate in your own little space given to you by the company each day. Obviously, you are a little confused...okay maybe a lot confused by what he just told you. You ask him to clarify and he does. He tells you that he does not want you to worry about anything at all; he just wants you to have your own space to meditate for however long you need. I don't know about you but I would absolutely love this job! For someone to tell me that I do not have to worry about anything and just meditate for a whole day may be the dream job. I bring up this "job" because it is extremely relevant to you and your dog even though you might not think so. Dogs by nature are easily excitable by different sounds and simply just by the bustling world around them. So when you are sitting there thinking "I wonder what (insert dog name here) is doing right now at home while I'm away". Most likely, there days consists of some sleep but for many dogs, they are responding to all the stimuli occurring around them every second. In their mind this is happening: "Oh, what was that sound?! ", "Wait when will my owner be back?! ", "What was that?! Do I need to be worried about that?! ", etc. If you can imagine doing that yourself all day, it would be pretty tiring. For dogs, this constant stimulation can produce anxiety based behaviors and anxious feelings. So this leads me to the whole reason of writing this blog post which is why it is important to implement a crate into your home. 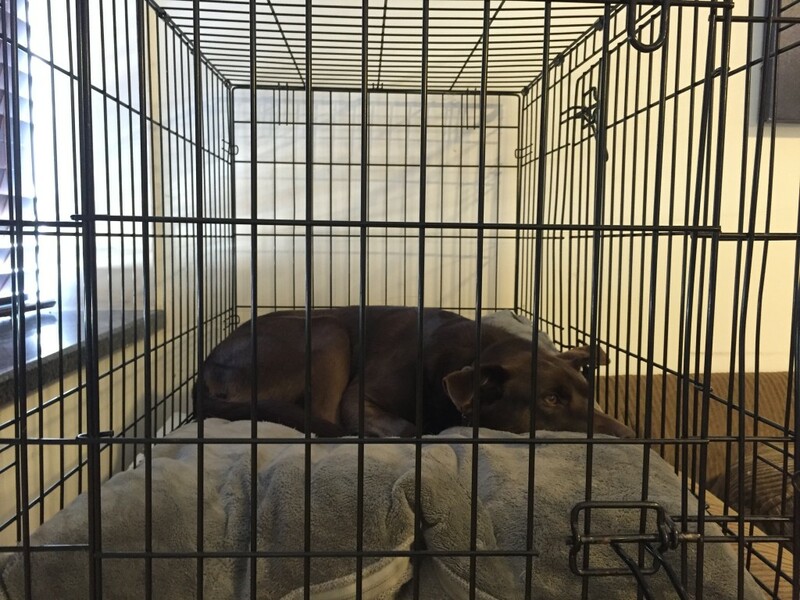 By implementing a crate into your home, you are giving your dog the job described earlier. All your dog has to do in the crate is to meditate and be calm. If you start using a crate with your dog while you are gone, over time the dog will begin to learn how to be in a calm state of mind. Once the dog learns to be in calmer state of mind, your dog is less likely to respond to the all the stimuli occurring around them which makes it much easier to train and teach your dog. Dogs are den dwelling animals and instinctively feel more safe and secure in their own place. The crate becomes a place that is theirs and only theirs. It is place they can go to to feel comfortable and safe. As owners, the crate tells the dog that they do not need to worry about the world and that we can handle it ourselves. When your dog finally realizes they can just be calm without a worry in the world, they will respect you more and you can start to become more calm as well. ← Is using a dog harness detrimental to walk my dog?